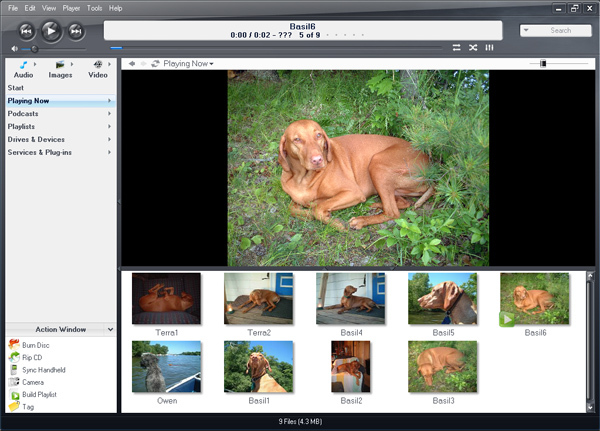 Music, photos and video YOUR way -- all from a single software program! Connect your PC to your home entertainment hardware and control it all with a remote! Load your music on your iPod while you watch TV! All with one easy-to-use program -- MEDIA CENTER! Copy music from MEDIA CENTER to a portable digital audio player or move digital camera photos into MC's powerful image library. Make a CD of music for your car. Record your favorite shows and watch them on your TV. More than one soundcard? 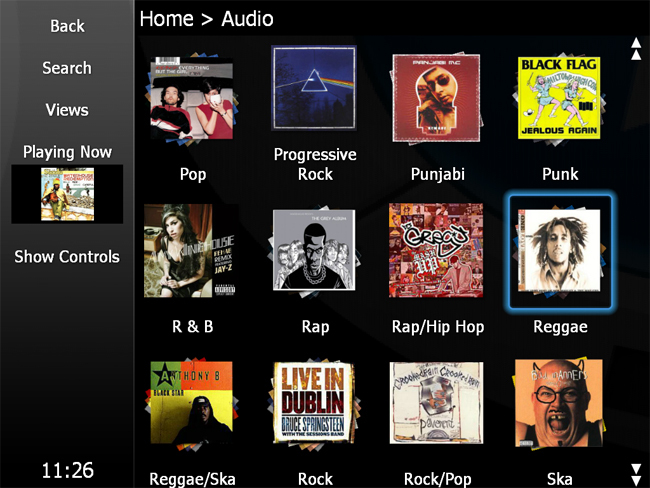 Play different music simultaneously in different rooms. MC's Media Server can even stream your music to your PC at work! The main image screen, showing thumbnails of digital camera images. An optional properties page can be opened to show details about each image. A unique full screen mode. This customizable view is designed for browsing your media on a monitor or TV from across the room. Type is enlarged and navigation is simplified for easy use with a remote device. 1. Fixed: Potential crash during Cloudplay uploading. 1. Changed: Updated to Monkey's Audio 4.66. 2. Changed: Updated Italian translation (thanks matteo e massimo). 3. Changed: Revised the usage of the buffering internet reader so it only engages for the file playback and not the file analysis of tags, images, etc. 4. Fixed: Some Cloudplay account/login problems. 5. Changed: Internet Explorer is always used for Cloudplay pages. 1. Changed: Spacebar in Theater View will toggle pause instead of starting playback over (if something is playing). 2. Changed: Updated to Monkey's Audio 4.64. 3. Fixed: The current track would not be shown when first loading a Playing Now view. 4. Changed: The multi-match CD dialog has a number at the front of each selection (so a match with the same artist and album will be distinguishable). 5. Changed: CD matches from the online database are trimmed before showing in the dialog. 6. Fixed: Improved compatibility with Handhelds which don't report a "Friendly Name", so instead use their Model Name. 7. Changed: When playback is started, the playing file will be displayed in Playing Now. 8. Changed: Updated Italian translation (thanks matteo e massimo). 9. Changed: Revised how /MonitorToggle works to hopefully make it work on more displays. 10. Changed: The command /MonitorToggle2 can be used to issue the command the old way. 11. Fixed: Media Center could crash when updating the Theater View TV Guide timeline in some cases. 12. Changed: When looking for lyrics at Google, the language of English is forced (to avoid German, etc. causing problems). 13. Changed: Made Google lyrics work for a few more songs. 14. Changed: When opening the "Open URL" dialog, if a URL is on the clipboard, it will automatically be used. 15. Changed: When lyrics change as the "Display Lyrics" option is enabled, they will update within a few seconds.